You guys. I won't disappear for months again, OK. I've got it together now. (Fingers crossed). This pizza is surprising. Its creamy rich avocado-y goodness baked into the crust. Balanced by the bitter/sweet arugula/lime/basil topping. OH MY. Seriously. Don't add cheese. It is SO good without. You want to let the beauty of the avocado shine on through. Keeping on with that plan is another works in Food & Fiction. from the spider by the light. fell gently where the door swings. flying on wings of silk cloth. To all but light, moth was blind. no capture of moths tonight. Combine the warm water, honey, and yeast in a small bowl. Whisk until dissolved & let it sit aside for 5 - 10 minutes until it starts to bubble/foam. Then combine your yeast mixture, flour, & salt into a mixer & mix on low speed for 1 minute with a dough hook. (or mix by hand with a wooden spoon). Then let the dough rest for 5 minutes. This step lets the dough fully hydrate. Change your mixer speed to medium-low for 2 -3 minutes (or continue mixing by hand). The bread is done when it feels somewhere between tacky & sticky. It should still be really easy to work with. If you feel it is too wet add another TB of flour. If you feel it is to dry, add another TB of water. Turn the dough out onto an oiled sheet pan & divide into two pieces. Form these two pieces into rounds & place equal distance a part on the sheet pan. Cover the top with plastic wrap & place in your fridge overnight. 1.5 hours ahead of pizza baking time, remove the pizza from the fridge so it has time to warm up & proof in room temperature before baking. Now move onto pizza baking step. After letting the pizza dough ferment in the fridge overnight, take the dough out of the fridge 1.5 hours prior to baking to let it warm up to room temp. Place a baking stone in the oven & preheat it to 500 degrees. If you do not have a baking stone then get out a large baking sheet & lightly oil it, but still preheat your oven to 500 degrees. In a small blender such as a smoothie blender or small food processor, combine the avocado meats, 5TB oil, garlic cloves, juice of one lime, and a pinch of salt. Blend until smooth. It should be spreadable but still thick. The thickness will depend on the ripeness of your avocados. If you think it is just too thick, thin it out with a tiny bit of water. Set this aside. In a large bowl toss together your arugula, basil, and red onion. Whisk together the lime juice of your other lime and last TB of olive oil. Toss this together with the arugula mixture and lightly season with salt & fresh ground pepper. Use your hands to toss this mixture together (slightly massaging the greens). Set this aside until later. Roll out one of the pizza dough rounds on a floured surface and if you are baking using the baking sheet, place on the oiled baking sheet. Top the pizza with half of the avocado mixture & spread evenly with a spoon. Then transfer it into the oven & bake for about 15 -20 minutes (until it is cooked & the crust starts to golden). If you are baking on a pizza stone then open your oven & use a glove to pull out the rack the baking stone is on. Drop on the pizza crust, quickly top with half of the avocado mixture (spreading with a spoon), and close the oven. It will be done in about 10 minutes or less (until it is cooked & starting to golden in spots). Once the pizza is cooked, remove from oven either with a metal spatula or with mittens & place on a cutting board. Top with half of the arugula mixture, slice, & enjoy! Repeat process with second pizza dough. My sketchers were mostly white, a little dusty from the walk. I was now standing with the trees to my back. I peered into the field in front of me. There a large rock had anchored itself into the earth, breaking the horizon. I adjusted the stick resting on my shoulder, the contents in the bandana at the end bounced slightly. So far, this was the farthest I had traveled alone from home before. I watched for ticks on my socks as I moved through the tall grass, just how my Dad showed me. The amber bristles tried to paint my legs as I walked. They tickled past me in waves. I floated across the sea. Drifting steadily towards the island. The rock was part concrete. It was a ruin? A shipwreck? I inspected the base and found old bits of newspaper stuck to the hardened mixture. I was curious at my discovery. I dropped my bundle, crushing the saltine crackers which were so preciously tucked into my knapsack. It was one of the few items I selected for my journey. I tried to read the bits of newspaper, trying to find clues or a date. It was unreadable and I moved on. There were little imprints of leaves hardened into the concrete. I spent what felt like hours tracing fossilized leaf veins with my finger tips. I loved my rock, it was my secret of unknown histories. I climbed on top of my ship and looked out at my grass ocean. It swayed gently, the waters were calm. I sat down and hugged my legs to my chest and sipped on a mini plastic bottled water I brought. I marooned myself. After awhile I poked through my supplies and I sprinkled the crushed saltines in the grass for the birds. The last thing I packed was my journal. I stared at the cover. It was denim with a rhinestone butterfly. I opened the inside cover and read my own hand, it said "Do not read. Please." I obeyed my own rule and closed the journal. I tried to remember why I came out here by myself, why I wanted to run away. I had been angry, that is all. I could not remember anymore, all that mattered was my oasis. A silent place with something no one else found interesting. From my lookout I saw a car coming down the road that cut through the field. The car kicked up a cloud behind it. I jumped down and hid behind my rock... I did not want to expose my location. The car passed and my hideout was safe. I folded the journal back up into the bandana and tied it in a knot at the end of my stick, like I had seen in cartoons. I began to worry that sharing my saltine crackers with the birds was a mistake... a grave error in my operation. I knew there was more food back at the house... but should I return? I looked back from where I had come, I could see my house from behind the trees. It's red brick peaking through the planted evergreens. I wasn't far away from my home after all. I could come back to my oasis whenever in need. I headed back towards the tree harbor... to shallower grass waters of the back yard. I had not even been gone an hour. Years later, long after the rock was hauled away, the field was leveled, homes were built, and I had moved away; I would think about that oasis. Some things, like that rock, just exist somewhere out-of-place. But really, they are exactly where they need to be. Chop up leeks, scallions, herbs, and garlic, then set aside. Trim and chop up the chard into slivers. Place in a bowl with the lemon juice and a tiny pinch of salt & drizzle of olive oil. Toss the chard and then place in the fridge to marinate while you make the rest. Add the 1TB olive oil to a medium skillet on medium low heat. Let it get warm and them add the garlic, toss for a minute, then add the scallions & leeks. Cook, tossing occasionally, for several minutes to soften. Turn off the heat and then dump the mixture into a bowl. Set these cooked onions aside for now. In a large bowl mix together the chickpea flour, baking powder, coriander, 1/2tsp of salt, and a 1/2tsp of pepper. Stir this together and then make a well in the center. Add the egg, milk, and melted butter. Combine well with a fork until the batter is smooth and there are no lumps. Add in the cooked scallion mixture and fresh chopped herbs. Combine well. Heat a small amount of butter or other oil in the same medium skillet - just enough to coat the surface - over medium heat. Once warm, place a heaped 1/4 cup serving of batter into the skillet. Let it cook several minutes, until bubbles are coming up in the center of the pancake. Flip and then cook a few more minutes on the other side. Repeat this with the rest of the batter. Serve the pancakes warm with a generous handful of lemony chard piled on top. You can also serve with a dollop of high-quality sour cream or creme fraiche. This is completely optional. Next time I'd go without - but it makes the photos look nice! Makes two large servings. I'm not sure why I went into the fog. There was something beautiful about the way it creeped. The way it crawled. A slow moving breath that had a thousand floating legs. As if someone was controlling the fog on a silent crank. It dipped down and up the hills of the farm, a caress between the fog and the ground. It was alluring. I could hear voices coming out of it. At first they were whispers. Sweet whispers. They made me remember a time long ago. It crept closer and I could no longer see the pines in the distance. I knew I should go back home, I had things to do. My legs didn't move as fast as they did years ago. A frost was setting in and the grass crunched beneath my feet. The fog gained on me, I could feel its tickle on my skin. "Bill! Where are you? Bill?" He liked to spend a few moments alone on the bench by the lake the mornings, he was such a quiet man. I love that about him. A quite confidence. I didn't like to be without him for long. Years back we abandoned our individuals. The fog was thick around me now. It was a blanket; dense, soft, and familiar. I needed to make the cake. We had the kids coming over later for dinner, it was Bill's birthday. Chocolate birthday cake, it was tradition. Bill and I would eat the leftover cake with coffee over the next several mornings, I was looking forward to this. Our kids always declined to take leftover cake with them because they know our sugary secret. When they were children, it was all we could do to prevent them from finishing the cake in one night. The fog was so thick now it was dizzying. I was lost in a cloud. I sat down on the grass to stop my head from spinning. I was still thinking of birthday traditions. The children... oh how they loved that cake too. I needed to get them to sign the birthday card for Dad. They would scribble in their names and cover the envelope with hearts and XOs. Each of them would have something small they made out of the craft box at home and, beaming, would give it to their Dad. I really needed to get back, the children had been alone for too long! Why did I wander so far? "Bill!" I yelled. "Bill, where are you?" The fog started to clear. The pines in the distance reappeared. I stood up and started in the direction of home. The fog was thinning quickly, just as quick as it came. I could see a man walking towards me in the distance, wisps of fog making his figure fade in an out. Oh how silly of me. I remembered that the kids weren't young anymore, they were grown. I had no card for them to sign, there would be no crafted gifts. Sometimes I forget. "BIll! There you are! I need to make the cake." The last bits of the fog passed away and I reached the man. It was not Bill. "Mom, I'm not Bill. Bill isn't here anymore remember? Maybe you shouldn't take walks too far away from home anymore. I could hear you shouting for Bill. Are you OK?" "Oh yes honey, I'm OK, it was the fog... I got confused." "It is alright Mom, lets go back. We have some Chocolate cake inside." Preheat oven to 400 degrees. Take two eggs out of the fridge and let them rest on the counter. Chop & prep all veggies. Toss together the broccoli, garlic, scallions, fresh dill, lemon juice, olive oil, and salt/pepper. Spread the broccoli on a baking sheet and bake in the oven for about 30 minuets, flipping half way through. Meanwhile, place the grits, water, cream, and a pinch of salt in a small saucepan, covered, over low heat. Let it slowly simmer until cooked about 20-30 mins, stirring occasionally. After it is cooked, season with fresh black pepper. About 10 mins before the grits are done, put about 2 inches of water in a deep skillet with the apple cider vinegar, and heat over medium until it starts simmering. Lower the temperature just a bit to keep the water at a low simmer. Crack one egg into a small bowl or ramekin. Gently slip the egg out of the ramekin into the skillet of simmering water and cook for 5 minuets, so all the whites are set but the yolks runny. Meanwhile distribute the grits between two serving bowls and top with broccoli mixture. 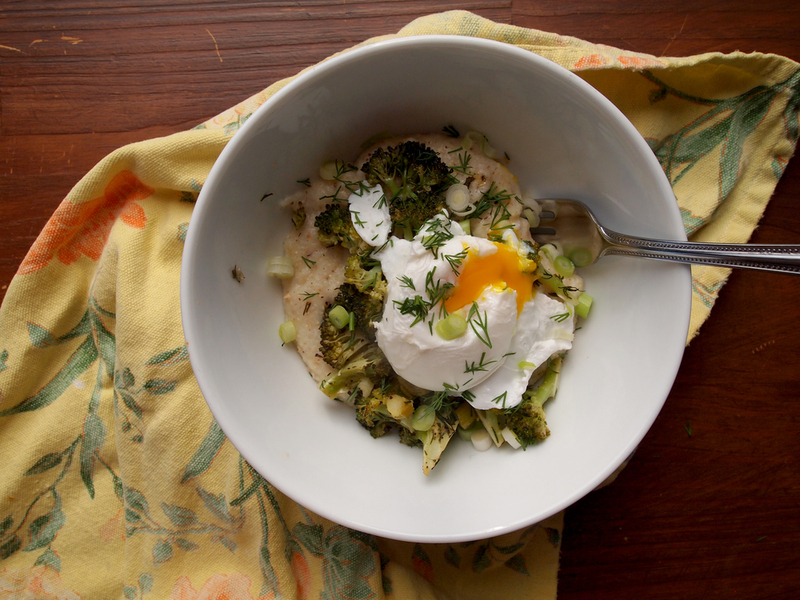 Remove cooked egg with a slotted spoon and place over the bowl of grits & broccoli. Repeat with the second egg. Top the bowls with lemon zest, more dill & scallions if desired. As I write I am listening to the mixed sound of soft thud & sharp pops that comes from the wintery mix beating down on the skylight above my head. Last night, I kept waking up in the early morning and doing a quick peak outside, hoping for snow, and disappointedly I would snuggle back into bed. I really wanted to see my dogs' paws and noses happily buried into the fluffy snow, I wanted to make oatmeal cookies and hot cocoa and I wanted to curl up by the fire and read fairy tales. Alas, the sleet and ice is here, snow will have to wait until next week. While a good portion of the country is under snow and ice right now, you think I'd have something like hearty warm soups, or a cassoulet, or perhaps a veggie packed shepherd's pie. Nope, I have for you spring rolls.... well, winter rolls. After Thanksgiving marathon eating and the patchwork of holiday parties and gatherings that come over these next 3 weeks... some lighter food is needed in between the decadence! Don't worry, the ample amount of ginger and the addition of spicy chile carrots make these fresh rolls satisfying on a winter's day. Unfortunately I did't get many in-process photos... winter's darkness creeps up on us quite quickly. So I'm providing some photos of-late via my iphone :). Don't worry, one of the next posts I have in mind will be extremely winter-appropriate and warming to boot. * This would be extra yummy if you let the chili carrots sit in the fridge overnight, or a few hours, to get extra spicy, but it is an optional step. Peel & julienne the carrots and place into a bowl. In a separate, small bowl, whisk together the sesame oil, rice vinegar, tamari, mirin, sesame seeds, & dried chile. Pour the sauce over the carrots and stir together with your hands, massaging in the sauce as you go. Set the carrots aside. Set on a medium pot of water over high heat to boil. Meanwhile chop up your scallions, grate or mince your garlic & ginger and add these into a blender or food processor. Once the water is boiling, dump in your bag of edamame. Let the edamame cook a few minutes until they are not longer frozen and they are soft and bright green. Drain the edamame really well and then add it to your blender or food processor. Add in the coconut milk to the edamame mixture and a good pinch of salt. Process the mixture until it is well combined and smooth, stopping and scraping as needed. Taste and adjust for salt. Dump the mixture into a bowl and set it aside with your carrots. Heat up enough hot water to fill a large bowl halfway, so you can dip the rice papers in easily. Prepare a clean work surface for rolling your spring rolls and set out your rice wrappers, bowl for hot water, bowl of edamame paste with a spoon, greens, bowl of carrots, and a clean platter. Once the water is done heating, pour it into your prepared bowl. Now you are ready to assemble. Dip one of the rice wrapper into the bowl of water until it starts to "melt" and get really soft and translucent. Takes about 20 seconds or so (If the water if too hot to handle, throw in an ice cube or two). Pull the rice wrapper out and lay flat on your prepared surface. Smear on a spoonful or two of the edamame paste across the center of the rice wrapper... stopping and inch or so from the edges. Add in a little pinch of fresh greens and a small handful of carrots, all the while stopping about and inch from the edges. Fold in the side edges of the spring roll and then grab the end closet to you and fold it over the center ingredients, tucking and rolling it over on itself until it becomes a roll! Yay! Place on the clean platter and then repeat with the other 14 rice wrappers. Serve with a bowl of tamari for dipping. I've explained my love for Afghan food in an earlier post here. One of the most interesting things about Afghan food is the significance it has with family. Most families have versions of dishes such as Aushak (or ashak) and curries that are unique to that family. Traditions past on through the act of doing, sharing, eating rather than through recipe notecards and magazines. One beautiful aspect of Afghan meal time is the dastarkhan. The "space" for eating a meal. Sometimes (I believe usually with larger family gatherings and special guests) a dastarkhan is used to set the space for eating. It is a piece of fabric or tablecloth spread across the floor and then arranged with the various dishes, bread, curries, rice, meats, and beverage, usually tea. The dastarkhan is a sacred space, not to be walked across or sat upon, just a place that holds the sacredness of enjoying and sharing a meal with family. Often, there is a designated tea poured and food server because these jobs have meaning, even the arrangement of food is taken into consideration; it all has significance. In our home, our table is typically strewn across with bits and pieces of whatever project I've been working on lately or whatever was in my hands when I walked in the door. Books, bags, laptops, keys, papers, glues, labels, mail, boxes... these all frequent my table more than actual food. I can spend so much time enjoying the preparation of the meal and, in the end, eating it can feel more of an afterthought because I don't bring the sacredness of enjoying a meal. Sometimes I have to clear a little placemat sized space open on the table just to eat... or we forgo it all and eat bowls of soup cuddled on the couch under a blanket. Don't get me wrong, couch eating has its place, but I should put as much intention into eating the food and enjoying the time to quite the mind, as I do while preparing the food. I feel as eating in a space with intention helps us to remain present. This aushak is delicious and, I promise, simple. It varies from the traditional a bit, but like I said, each family has their own version. It is typically a leek filled dumpling served with a yogurt sauce, spiced ground meat topping, and dried mint. This version combines leeks and scallions, steamed in peppery broth, and topped with a garlic-mint yogurt. Its wonderful and best enjoyed in a sacred space. If you do not want to make all the dumplings at once. Reserve the left over fillings and wonton wrappers separate. Already steamed dumplings do not keep well, so steam to order :). You can, of course, make your own pasta dough here, but this time I choose the quicker version of using pre-made wonton wrappers. Stir together the yogurt, 2 cloves worth of the garlic, and the fresh mint in a small bowl. Sprinkle in a pinch of salt and pepper and stir again, sit it aside for later. In a large skillet heat up the coconut oil on medium high heat. Add in the other clove of minced or grate garlic and the leeks/onions. Cook stirring frequently until softened. At least 5 minuets. You want them to be soft and buttery tasting but not mushy. Season with the cayenne and some salt and then turn off the heat. Heat up a medium skillet with a lid with 2 cups of the broth sprinkled with the whole peppercorns on medium low. You want to bring this mixture to a simmer and keep it there, keep it covered. Get out the wonton wrappers and a little bowl or cup of water. Lay out your wonton wrappers individually onto a clean surface. Spoon a small spoonful of the leek mixture into the center of each of the wontons. Then dip your finger into the water and spread two connecting edges of the wonton wrapper (one wonton at a time) with a strip of water. Fold the dry edges of the wonton wrapper over onto the wet edges, making a triangle and pinch together to seal. Make sure you only spread the water on one wonton at a time because the water will soak up/dry out so you need to fold it over right after you wet it. Repeat the process with all of your wontons. (If you aren't making all of them make sure you wrap the wonton wrappers up well so they don't dry out and keep the leek mixture separate). Once the broth is simmering, lay in the wonton wrappers in one flat layer, try not to let them touch or they will cook together. You will need to do this in batches. Return the cover to the skillet and let them simmer/steam in the broth for 3 minuets. You might, occasionally need to add in a little more broth as you cook the dumplings in batches, in case too much steams out. Removed from the broth with a spatula and lay on a plate, drizzle with the yogurt sauce and sprinkle with extra chopped mint, if desired, and serve warm. "Hey, sweetheart, I'm on my way home. Do you want me to grab dinner?" "Oh, no, love. I'm making something at home for us." She hung up the phone. She set to work cleaning up her mess; trimming and cutting away at the bodies, forming them into manageable pieces. It was an unusual meal. She pondered over a recipe, something simple. All that chopping had left her tired. Tired and hungry. Maybe... roasted in their own juices until tender? Salt and pepper of course, oh and olive oil! Certainly, olive oil! A little lemon to make the flavor pop. The smells from the oven were heavenly. She salivated. The dogs were in the kitchen licking at the floor in their primal states. Waiting for more tasty morsels to drip from the counter. The door open and he walked in. He saw the red soaked cutting board and her stained hands. He stopped. Whoever thinks vegetarianism can't be gruesome has never cut their way through two bunches of fresh beets. This wrap is great, I've made it a few times and it has turned a beet hater (Ty) into a roasted beet lover. Preheat your oven to 400 degrees. Begin with making your flatbread dough (or use a pre-made flatbread). Mix together the flour, baking powder, and salt. Then stir in your yogurt with a wooden spoon until the dough becomes workable with your hands. Knead for a few minuets. If the dough seems a little too sticky or dry, add in a little more flour. Cover the bowl and let it chill in your fridge while you prepare the rest of the wrap. Wash and chop up the beets into thin rounds and put them into a bowl. Slice up the beet greens into slivers, discarding any extra tough stems and place them into a separate bowl. Add in the slivered onions to the beet greens. 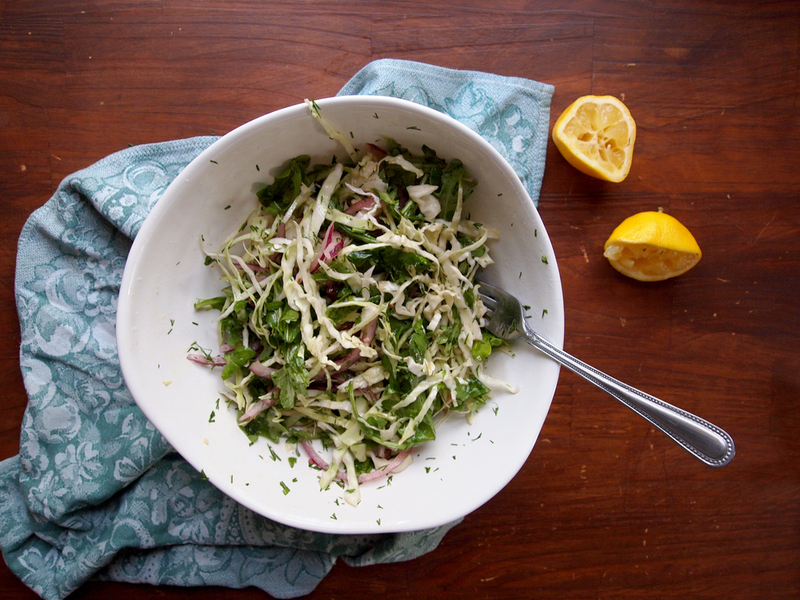 Squeeze over the fresh lemon juice into the greens and sprinkle with a small pinch or two of salt. Massage the lemon and salt into the greens and then set the bowl aside. Now back to the beets. Toss the beets with the 3TB of olive oil and at least a teaspoon of salt & pepper each. Lay the beet slices out on a baking sheet and roast in the oven for about 20 minuets, until cooked and tender, stirring the beets half way through. While beets are roasting, go back to your dough and divide it into six balls. Heat up a skillet (cast iron works great here) on the stove top over high heat. Clean a work surface and sprinkle with flour. 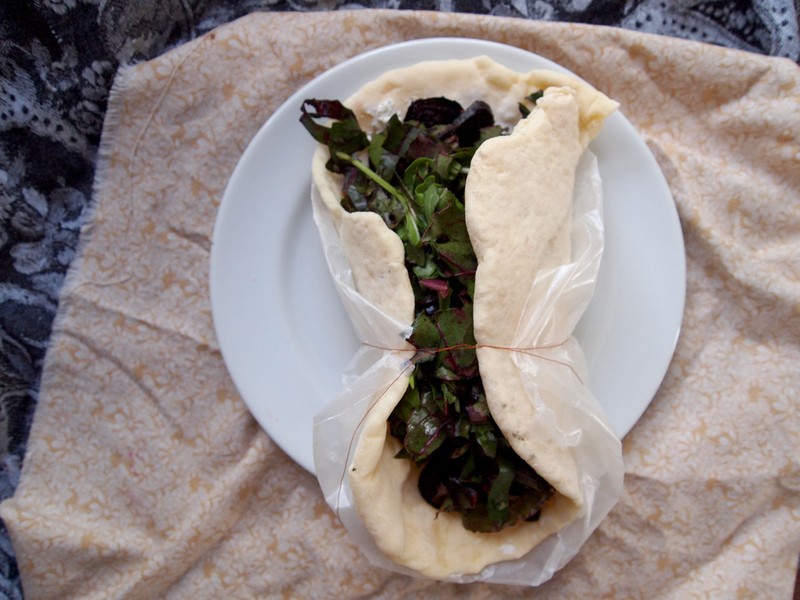 Place one ball on your floured surface and roll it out thin, into a round flatbread. Once your skillet is very hot, lay your flatbread on the skillet. When it starts to bubble up, flip the bread. When it starts to puff up with air, it is done and remove from the skillet. Repeat with the other 5 dough balls. After the breads are cooked and the beets roasted spread the center of a flatbread with 1Tb or more of goat cheese. Lay on top 1/6 of the beets and then top with a big handful of lemon greens. Repeat with others! The lemon greens and beets keep well when stored separately. Enjoy! This week was an explosion. After the cold spell of last weekend and our first hard frost, the leaves decided that it was Autumn. Sprays of orange, red, and yellow arched over all the roadways and street trees, their clipped canopies look like brightly colored Christmas ornaments dangling over the sidewalk. I love this weather. The forests get excited too, dressing up for a fancy party once a year. I get equally as giddy, how could you not with all these fancy, well-dressed trees around? Fall time is where energy is directed downwards, into the roots, a very building time of year. I've rooted down deep into the things that I am doing, and I am building them. Enjoying my job, building my side business (Forest Things), and working here in the space. I'm excited for this fall time, for root building, and for soup eating. This soup is vegetarian take on a portuguese soup called caldo verde. It is usually a potato soup with sausage and kale or collard greens. I've adapted my recipe from this recipe on food52. I was particularly drawn to it because cooking cauliflower with paprika is one of my favorites, something my grandmother use to to a lot when I was a kind. Served steamed, drizzled with melted butter and paprika. Delicious. Preheat the oven to 350 degrees and chop/prep your cauliflower, onions, mushrooms, and garlic. Toss the chopped cauliflower in a bowl with 2TB olive oil, 1TB of the paprika, 1TB of the cumin, 1tsp of cayenne, and then a few good pinches of salt. Lay the cauliflower out on a baking sheet and roast in the oven for 30 minuets, turning half way through. Meanwhile, heat up 2TB of olive oil in a large pot on medium and add in your garlic and onions. Cook and caramelize your onions for about 20 minuets, stirring frequently. Then add your chopped mushrooms and cook stirring frequently for another 10 minuets. Once the cauliflower is done roasting, pour a little liquid into the pan to de-glaze. Then scrape the cauliflower and loosen the stuck-on bits into the pot of onions and add in the mushroom broth. Simmer for 10 minuets. Place the soup into a blender and blend for a minuet or two, until smooth (or use an immersion blender if available). Add the soup back into the pot and keep on low, adding in a little water to thin out the soup to the desired consistency. Taste and adjust for spices adding more salt first. Then add in the rest of the paprika & cumin and the cayenne if needed. Heat up the last TB of olive oil in a medium skillet on medium heat and add in the collard greens, tossing as you cook for several minuets. Add in the lemon juice and salt, cooking it until it is wilted but still vibrant and green. Add the collard greens into the soup and stir. Ladle the soup into bowls and top with toasted pine nuts, if desired, and another sprinkle of paprika. I've admired film and photography for most of my life. I've always been particularly responsive to visuals and to sounds. Also to words. I remember my life in little clips and frames. I have an unusual amount of memories from early years... from when I was one or two but they are mostly visuals. I think of them as memory vignettes. They are places that were very comforting to me or of places where I first felt strong emotions.... a favorite carpet or the feel of petting a dog. We lived on the coast in New Bern, NC. Brackish waters are everywhere there, including the pond in our back yard. There was this wooden board walk through this marshy area and tall pines to the dock where my Dad use to set crab traps. I don't really remember the board walk but I remember sitting in the back yard and looking at the thick bed of pine needles and ivy that grew around the start of the boardwalk. In my eye is the coarseness and texture of the wood. I also remember being taught to shell a crab. Feeling the moist steam of a boiling pot of water and my Dad helping my fingers pop out unwanted parts of a crab. I was confused at the yellow smears of crab gunk on my fingers. I remember my Dad telling me that we needed to get rid of the gunk because it was poisonous... and being afraid that I might accidentally be poisoned by crab in the future. In my nose is the smell of salt and fish. These little frames, moments, memories of experiences are who we are. It is art when I am able to read someone else's experience, and get a frame into their life. It is a point where lives touch in a deep and internal way, a private world. It is why we write, why we take photos, and why we read. The look in a strangers eye from a photograph, or the way colors bounced off each other in a landscape description; they touch me and remind me of my personal vignettes that I guard. I loved this, it was a secret to me. I was consumed in this private life, so much so that I use to be a rather quiet child around strangers. I just absorbed all the visuals without vocalizing much in return. I wanted to be a photojournalist, it is what I started out doing in college for the first few months. I was set on working for national geographic... and who wasn't. Any of us would love that job. At some point I became very hard on myself, I lived in an unrealistic world, or maybe it was the mindsets of other people that made me feel this way. I changed my major, to another design degree, landscape architecture. I had considered it before and it is something creative, involving the environment, helping people, but technical and marketable... it seemed safe. I practiced photography occasionally, when I was somewhere beautiful and I could actually hold visual vignettes down the road and share them with others. I don't know why I use to give up on things I loved just because they seemed unrealistic. I should have put more confidence in myself and lived with a little less fear. I have a decent camera, I got it for about $400 years ago. It is the nicest camera I have ever owned. Of course there are much, much better cameras. I've never had any formal training in photography or in film, although I have worked heavily with photoshop in college... but mostly because of self education and interest. I've stopped myself from really trying to produce films and better photography and I've made plenty of excused because I am constantly comparing myself to the work of others whom I admire. That is where I have to stop. For me, it is all about the vignettes of memories, stories, and emotion, the things that make you who you are and I want to stop hiding. I'm aware that in comparison to the works of film and photography that are out there, I'm not outstandingly impressive. I'm ok with that, because right now, this is me with my point n' shoot, tripod jerry-rigged onto mason jars, imovie, wrinkled linens, and really delicious food. I'm proud of it, happy about it, and loving to show you and introduce you to the vignettes that make up my life. I hope you enjoy and share some of yours with me. Watch the video above, The song is Cristobal by the artist Devendra Banhart... one of my favorites. This recipe is delicious... I've already made the sauce two weeks in a row, so much beautiful autumn squash. It is definitely inspired by mac n' cheese... just one you can feel much better about eating. Just make sure you get the roasted squash blended into a sauce before eating it all, that stuff is ridiculous, like sweet candy. Clean a counter top or a large cutting board and spoon your flour into a pile in the center. Sprinkle in some salt and mix together, patting the flour back into a central pile. Make a well in the center of your flour large enough to hold three eggs and a splash of olive oil. Crack in your eggs and then pour in a generous glug of oil. Use a wooden spoon to gentle stir the eggs, breaking the yolks and slowly incorporating the flour from the sides. Keep going until you whittle away at the sides of the flour, this will take a little while. Once the flour is too sticky for the spoon, flour your hands and gather the dough together, using your hands to incorporate all the rest of the flour. Knead the dough for several minutes, until soft and silky. About 5 minutes kneading. Preheat the oven to 400 degrees. Let the pasta dough rest on the counter while you chop up all your veggies and garlic. Set the chopped/prepped ingredients aside and pick back up with the pasta. Take out your pasta dough and cut into 4 pieces. Flour a clean surface and roll out one of the dough pieces very thin... it should be a little translucent. (Of course, if you have a pasta roller, use that) Flipping and rotating the dough as you go, and adding more flour to prevent sticking. Try to roll the dough into a rectangle if you can. Trim the edges of the dough off, so that you end up with a rectangle. I saved the dough trimmings to roll out again in the end. Cut the flat dough, with a sharp knife, into about 1" to 1 1/2" rectangles. Get a little cup of water and place next to your working area. Now, pick up one piece at a time and add a little dab of water to the center and pinch the top and bottom of the rectangle together in the center. Then use your thumbs and index finger to pinch together/flatten out the sides of the dough, it should resemble a bow tie. This process can take a little while, but you will get into a rhythm. Of course, you can just cut the pasta into a different shape, like long linguine noodles, it would be faster. Lay the bow-tie pastas out on a baking sheet to dry a bit until we are ready to cook them. Repeat the process with the other three dough balls and then gather up all your trimmings into a ball and roll those out into bow ties as well. Toss the squash cubes in some olive oil and salt/pepper and lay flat on a baking sheet. Roast in the oven for 35-45 minutes, until the cubes are soft, a little browned in spots, and very sweet. Toss the broccoli pieces together in the bowl you used for the squash (no need to wash) with some olive oil and a little salt/pepper. Lay the broccoli out on a separate baking sheet and roast in the oven for about 20-25 minutes until a little brown but still slightly crunchy. It works well to put the broccoli in the oven after the squash has been in there for about 20 minutes... so that they can both come out around the same time. While those are roasting, bring a medium/large pot of water with a pinch of salt to a boil. Also, heat up a medium skillet with 1 TB of olive oil on the stove. Once the oil is warm add in your garlic, cook for a minute and then add in your onions. Let it soften, stirring occasionally, while the broccoli/squash are roasting. Let the onions cook for at least 10 minutes. Add in your sage to the onions and cook for another minute or two. Remove from the heat and then pour onion mixture into the blender with the roasted squash, set this aside until the pasta is done cooking. Once the water is boiling add your pasta, I added the pasta in 3 batches, using a large slotted spoon to remove and drain the pasta. You will want to reserve at least 1 cup of pasta water to thin out the sauce. The pasta takes about 3-5 minuets to cook, or until al dente. Once you remove the pasta, let it drain in a colander and give it a quick rinse with cool water... so it stops cooking. Blend together your squash, onion mixture, 1 cup of milk (or milk alternative), and 1 cup of pasta water. Scrap down the sides, taste the sauce and adjust salt/pepper and add more pasta water if you want the sauce thinner. Depending on how fast you worked, the sauce might need to be re-heated on the stove before adding it to the pasta/broccoli (even though we were very happy eating it straight from the fridge, cold, the next day) Toss the sauce, broccoli, and pasta together. Enjoy... this stuff is like candy... it is worth it. Directions for just the sauce. Preheat your oven to 400 degrees. Chop up all your veggies, sage, and garlic. Toss the squash in a bowl with olive oil salt and pepper and then lay the squash out flat on a baking sheet. The squash will roast for about 35-45 minutes until it is very soft, a little brown in spots, and very sweet. Reuse the same bowl to toss your broccoli together with the olive oil and salt/pepper. Lay the broccoli out on a separate baking sheet. After the squash has been in the oven for about 20 minutes, add the squash in the oven as well... so they can both come out around the same time. The broccoli will roast for about 20-25 minutes, until slightly brown but still a little crunchy. While the squash/broccoli is roasting, bring a salted pot of water on the stove to a boil, this will be to cook your pasta. Also heat up a medium skillet on medium heat with 1TB of olive oil. Once it is hot, add in your garlic, cook for a minute and then add the in onions. Let the onions soften for about 10 minutes, stirring occasionally, and then add the chopped sage. Cook for about 2 more minutes and then turn off the heat. Cook your pasta until al dente and then strain out your pasta, reserving at least 1 cup of pasta water, and giving the pasta a quick rinse with cool water. Toss the cooked squash, onion mixture, 1 cup of milk (or milk alternative), and 1 cup of pasta water in a blender and blend until smooth. Scrap down the sides of the blender, taste and adjust salt/pepper, and add more pasta water if you want the sauce thinner, and then blend again. Toss together the cooked pasta, roasted broccoli, and sauce. Enjoy... this stuff is like candy... it's worth saying twice. I always have the urge to bake when those leaves start crisping up and the sweaters come out. There is something about the ambiance of being cozied up on the couch with a good book on the weekends and watching the wind blow free yellow tulip poplar leaves as they travel, glide, and then graciously come to rest among their fellow brothers on the earth. After some moments of watching I place my socked feet on the hardwood and wander to the kitchen to poke around at the little bits of this and that. Opening the fridge a few times and checking the inventory of the dry goods cabinet, I allow my mind to stroll into the land of sugar and pastry and to warm sugary breath against cool air. I might stall, place the kettle on to make tea, but by the time the water is hot I already know that I am sucked in and that I am baking. The first time I had a muffin with one of my favorite combinations (goat cheese & rosemary) was at the bakery I use to work here in Charlottesville. It was a fall special we did occasionally. I only had this muffin there once... and I think about it with frequent adoration. The muffin at mudhouse is quite different than this one... at the bakery it was sour cream batter based and the rosemary was infused... giving it a stronger, earthier taste. This one is a recipe to be made on the spot and one that is good for using up any extra yogurt you have on hand. These muffins are mildly sweet and balanced so nicely with the savoriness of the goat cheese and rosemary. You must try it next time the cold brushes your skin. Preheat your oven to 375 degrees and butter a muffin pan. Add in your butter and sugar together in a mixer and cream together 5 minutes, scraping halfway through, until light and fluffy. Meanwhile, in a separate bowl, mix together your flours, baking soda, baking powder, salt, and the two different rosemaries. After the butter/sugar is creamed, add in the eggs one at a time while beating on medium low, scraping in between. Then add in your yogurt and stir until combined. Add in the flour and blend on low until just combined, you do not want to over-mix, as it develops the gluten/toughens your pastry. (If your batter seems just a little too thick, add in your splash of milk here and mix together, if not, then omit.) Then add in the goat cheese and drizzle over the honey, stir by hand until distributed... the streaks of honey are ok! Place your oats into a blender or food processor and pulse a few times to get a coarse oat flour. Toss these oats with the sugar, ground flaxseed, and flour. Then pour over the melted coconut oil and combine. You should be able to pinch it together into moist crumbles. Distribute the muffin batter evenly into the 12 spaces and then evenly distribute over the topping. Lightly tap the topping into the muffin batter with your fingertips to secure. Bake in the preheated oven for about 25-30 minutes or until completely cooked and slightly golden. Covered porch, a well-used swing, soft breeze, early evening warmth, citrus juice on fingers, bare feet, radishes sprouting nearby, sleeping dogs, two palomas. Apparently, the paloma is the most ordered drink in Mexico and it is made a variety of ways. Sometimes it is made with fresh grapefruit juice and them sometimes with a grapefruit soda - typically jarritos. I chose the fresh juice route. I also sweetened this with agave because I think it compliments any tequila drink but feel free to use honey or a simple syrup. A dinner of turnips + french beans in butter + Prosecco. Sometimes it is fun to make a small array of side items from produce lingering around in your refrigerator. Pair it with one fancy item, in this case prosecco, and you have got a special meal. Prosecco goes surprisingly really well with this vegetable meal. It's light, dry, sweetness complimented the butter, warm turnips, and french beans. Turnips roasted in butter & paprika. Turnips - 3 medium/large turnips. Preheat over to 400 degrees. Cut up the turnips into wedges. In an oven-proof deep skillet melt the butter on medium heat. Add in the turnips and toss to coat. Add in the paprika, I used about 2tsp, and the salt/pepper to taste and toss to coat. Place the skillet in the oven and cook for about 20 minutes, stirring once half way through. Haricot verts in butter, garlic & lemon. Heat up a large skillet on medium heat with the butter, once melted add the garlic. Cook for about 1 minute. Add in the french beans and cook, stirring constantly, for about 3 minutes. Add in the lemon juice and the splash of white wine vinegar. Cook for about 2 more minutes. Season with salt and pepper. Turn off the heat. Place everything into bowls and serve with crusty pieces of bread & something fancy, like prosecco. This soup will make such a lovely shade of green if you have a good blender or immersion blender. My soup was printed with flecks of watercress green, but it was just as tasty. Originally, I had not planned on making this a creamy soup but the process just took me there and I am glad it did. Although, if you want to cut back on the dairy, this soup will still be just as good. You could double the bunch of watercress and it would be better yet. In a medium pot melt 3TB of butter on medium heat. Add your garlic, onions, and fennel. Cook no more than 5 minutes and let them soften. Add the vegetable broth and potatoes and heat up the broth to a low boil until the potatoes are cooked. Add in the watercress and cook for 2 minutes. Turn off the heat and put all the soup into a blender, blend until smooth. Add the soup ingredients into a pot, stir in the wine and parmesan and cook for just a few minutes on low heat. Run the soup through the blender again if need be. Season with salt and pepper. Turn off the heat and slowly stir in the heavy cream. Taste and adjust the salt and pepper. Pour into bowls and slowly stir in a little extra cream on the top of each one and sprinkle with fresh black pepper. I was listening to an This American Life (I start way too many conversations with "I was listen to The American life") rerun and there was a story about a retired man who wanted to start a cable channel from scratch in the early 90s. A channel called the puppy channel. Naturally, this is brilliance. A channel entirely donated to the cuteness and adorableness of puppies with nothing but soft instrumental music in the background. Now I don't want to hear any complaints "hey, what about kittens? Monkeys? Sloths?" All other cute animals aside, puppies alone are cute and entertaining. The man explained his inspiration came when he saw a diverse group of people in a parking lot all standing around and watching some puppies. People from all points and acts of life paused for a brief moment to smile at puppies. Why? Puppies make us feel better, they make us happy. I looked back in my car at my own fully grown puppies. They were chasing after the back windshield wipers. Yeah I have to agree, they do make us happy. A cake can do the same thing. Especially one scented so sweetly with rosemary. Rosemary, it is like an old friend; warm and comforting. Mix that into a cake with apples? No doubt it makes you happy. This cake is perfect, moist, with the apple chunks soft and starting to infuse in the layers. It is the sort of cake I could eat everyday if you could healthfully eat cake every day. The rosemary warms up the batter and compliments the apples wonderfully. Apples - 2 chopped in small & medium chunks. Preheat oven to 350 degrees. Heat up the heavy cream in a small pot in a low simmer with the 1TB of dried rosemary. Turn it off once warm and let it steep, covered, for 30 minutes. Once it is steeped, strain out the dried rosemary and whisk in the rosemary powder. Mix together the flours, baking soda, baking powder, and salt in a bowl and set aside. Add the butter and sugar into a mixer with the paddle attachment. Beat on medium speed for 5 minutes, until light and fluffy. Scrapping with a spatula half-way through. Add in the two eggs and mix until combined. Alternatively (3 batches each) add in the flour mixture and milk mixture. Scraping with a spatula when necessary. Last, dump in your apple chucks and stir in by hand, with the spatula. Pour the batter into the greased springform pan and tap the pan down on the counter to settle the batter. Place in the oven and bake 50-60 minutes or until a pick comes out clean and cake is puffed up. Let cool at least 15 minutes (if you can) and dust the top with confectioners sugar. I served mine with anise tea but served with a dollop of fresh whipped cream or apple ice cream would be delicious. I never really did the whole college ramen cuisine thing. Not because I didn't eat easy, packaged food, I did. I was just way too weight concerned (with incorrect nutritional knowledge) that I wouldn't make a habit of a whole meal out of carbs (still a good habit not to do). I missed the boat on the ramen train, admittedly, I'm a little sad about it. Recently, we took a weekend trip into DC. We went to the United States Botanical Gardens, The National Museum of the American Indian, did a lot of walking around, visiting memorials, flea market, Sigur rós show, ate at a great Indian restaurant, crêperie, and an El Salvadorian pupusaria. Although I have this image stuck in my head from a magazine about DC's 100 best restaurants. One of them being a restaurant that sold traditional Japanese ramen. Oh my stars it looked good. Ty glanced at it and responded, "I want that." Yes Ty, so do we all. This is my version of traditional Japanese ramen that is not so traditional. Traditional ramen varies in the type of broth, a fish broth, pork broth, soy sauce broth, or miso broth. There are some borrowed flavors from pho broth here, but also I combined the soy sauce and miso style broths into one. I also took my hand at making homemade noodles. They were very good and easy to make even though I do not have a pasta machine. Feel free to buy regular ramen noodles too! Veggie broth - Great time to use your own if you have, you want it tasty. Make the noodles. Mix together the flour, salt, & baking soda in a bowl. Make a well in the center and egg in the egg yolk. Pour in 1/4cup of water in the well. Using your fingers mash up the egg yolk with the water and stir into a slurry, slowly incorporating the flour. Adding in another tablespoon at a time until all the dough sticks together but before it sticks on your hands. Knead the dough with your hands for several minutes. If it gets too sticky, sprinkle in a little extra flour. Let the dough rest in the bowl for 30 minutes at least but an hour would be better. Go on with the rest of the meal. When the dough is done roll out the dough into a long rectangle as thin as you can get it. Lightly flour the rectangle and fold it in half, hotdog style. Take a very sharp knife and slice into very thin noodles, mine were about 1/8" thick. Unfold the thin noodles and lay out flat to dry for a bit. Heat up the veggie broth with the lemongrass and star anise and let it simmer/ low-boil for 30 minutes at least. While the broth is simmering, prepare the rest. Heat up 2TB of sesame oil in a large skillet on high heat and then toss in the tofu. Toss and flip for 5 minutes or so until they turn golden. Add in 1TB of tofu and stir until combined. Dump out the tofu into a bowl and add in the last TB of oil. Add in the garlic and sliced mushrooms, cook for about five minutes until it colors a bit. Add kale (in two batches) cooking for a few minutes until wilted and all the kale can fit into the pan. Add in 1TB of mirin and stir until combined. Pour out into a bowl. Strain out the broth and place back into the pot and keep on low heat, do not let it boil at this point. Add in 1TB of soy sauce, rice vinegar, and miso. Whisk until combined. Heat up a medium salted pot of water to a low boil. Add in the noodles and the whole eggs and cook for 5 minutes after they get back up to a low boil until done. Run the eggs under cool water. Distribute the noodles into four bowls and ladle over some broth. Top with some of the kale/mushroom mixture on one side, sliced radishes on the other, tofu cubes in the center, and then sprinkle over some scallions. Peel the hard boiled eggs and slice in half carefully, the yolk will still be runny. Place an egg half in each bowl and squeeze over some sriracha. Heat up the whipping cream with the hibiscus in a small sauce pan over the stove until fumes rise and the cream starts to simmer very slightly. Watch carefully as you don't want the cream to boil. Turn off the heat after it simmers and let the hibiscus infuse in the cream until it turns a nice deep shade of pink, stirring every so often. Strain out the hibiscus and put the cream in the fridge to cool. Shift together the flour, sugar, and salt. Cut the frozen butter into small cubes and pulse the butter, egg yolk, and flour mixture together in to a food processor until it is a coarse meal. Add the very cold water to the food processor, 2TB at a time until the dough just holds together. It is ok if there is a bit of crumbly/dry spots. Press the dough into a ball and wrap with plastic wrap. Place in the refrigeration and leave for at least 30 minutes. Meanwhile, make the curd. Pre-heat the oven to 350 degrees. In a bowl beat the eggs, yolk, sugar, and lemon juice together. Move the mixture into a small saucepan and place on the stove over low heat and add the butter cubes. Whisking while it melts/heats. Keep whipping/stirring until the mixture thickens and is thick enough to coat the back of a spoon. Keep whisking and add the mascarpone by the spoonful until it melts and make sure it is still thick enough to coat the back of a spoon. If it isn't keep whisking over low heat until it is. Take out your crust and cut into 4. Roll each quarter into a ball and then roll it out big enough to fit your tart pans. Grease the tart pans and then press in the crust on the bottom/sides. Repeat with the other 3. Place the crusts temporarily in the freezer and store the extra crust (if any) in the manner of your choosing. (You can store the leftover crust by freezing wrapped in a plastic wrap, in the fridge for a few days, or pressed into mini tart pans and frozen.) Let the curd cool for about 5 minutes and the tart crusts stay in the freezer for about 5 minutes. Take out the tarts and pour in the curd and distribute between the four tarts pans. Tap each tart down on the counter to settle the curd and then place into the oven. Bake for about 20-30 minutes until the crust turns golden and the curd puffs up and slightly colors. Let the tarts cool while you whip the cream. Take out your hibiscus infused cream and place it into a mixer with the whisk attached. Turn on medium/low heat until the cream starts to foam/bubble and then increase the speed to a medium high/high speed. Start adding in the sugar slowly, 1TB at a time as the cream is whipping and thickens. Stop once the whipping cream has reached your desired thickness. Top onto the tarts and serve. Some of the best meals come from using up everything you have in your fridge. We were going out of town to visit our family and friends for almost a week. I had some things that were already needing to be used so I decided to make them all together so I didn't have to throw anything out! Also known as "the day before grocery store day." I'm surprised everything I had left went together so simply in a one-pan recipe. We took all the leftovers with us the next day, so it travels well too! Jerusalem artichokes are delicious. If you have never tried them they taste a bit like water chestnuts when they are raw but more like potatoes after cooked. They grow natively to the eastern parts of the United States and are a tuber that produces a tall stalk with beautiful, yellowish, sunny flowers. Easy to grow in a garden, even if you just use it as an ornamental garden accent. Last summer we went camping at a place around the Alabama/Tennessee border called the Walls of Jericho. It is a unique geological formation with huge river gorge walls. To get to the camping spot we had to cross through a large a sea of jerusalem artichokes growing so thick you could get lost in it. They were growing taller than our heads, it really was quite beautiful. I thought it was fitting that these Jerusalem artichokes were growing prosperously at the entrance to the Walls of Jericho. Fava beans - 1 cup dried and then soaked/cooked. Soak the fava beans for 8 hours or overnight and then boil until tender but not mushy. Drain. Prep all your ingredients by chopping everything up and getting it ready for use. Heat up 1-2TB of olive oil in a deep skillet on medium high heat. Add the garlic and onions. Let cook for several minutes until soft. Add in the fava beans and cook 5-10 minutes until starting to crisp and golden, adding in more olive oil if needed. Pour fava bean mixture into a bowl. Heat up another 1-2TB of olive oil and add in the potatoes and jerusalem artichokes. Let pan fry, stirring frequently, until the potatoes are tender about 10 minutes. Add in the arugula and let cook for a minute until wilted. Pour back in your fava bean mixture and stir to distribute. Add in the tarragon and salt/pepper to taste. Cook a minute, until heated through and then add the parsley, lemon juice and olives. Stir and turn off the heat. Season Taste and adjust salt/pepper if needed. We woke up to no power, 6" of snow with more falling, and really excited puppies! I was equally excited and we bundled up to go out and play. It was Rue's first time in inches of snow and it was deep enough to cover her legs and brush up against the underside of her belly. She was hopping around like a rabbit and sticking her face deep in the snow until her nose touched the frozen ground. She was adorable. Banjo was made for the snow. As soon as she gets out and sniffs the air, it fills her up with some sort of wild, primitive, wolf spirit and she starts running in circles, flailing her paws attacking the snow. We all licked up our fill of snow, made snowballs, played with the dogs and banjo uncovered a large, four pointed antler a deer had recently shed. Best dog treats ever, no joke. I was too distracted to take photos but I'd better include this puppy photo of banjo during her first snow in 2010 for good measure. After playing we were hungry for a hearty breakfast and fortunately we had use of our stove still, since it is gas. I made this delicious brunch dish from the leftover celeriac after the russian beet salad wrap. We enjoyed the rest of the snow day, Ty got out of classes and a mid-term, and we kept close to the wood stove reading books by candlelight. Now, some of the no-power charm has worn out, it is 3 days later and we are still without power, water, have spoiled groceries and sadly, no internet to keep you updated! So I find myself sipping on some tea at our local tea house, bumming the internet, light, and power outlets. This is one of the last meals we had made at the house since loosing power - it is just too difficult to keep washing dishes without water. Polenta, grits, or corn meal to dust. Fill a medium pot with water 2/3 full and add a pinch of salt. Add in potatoes and celeriac and boil until soft and easily pierced with a fork. Add cooked potatoes/celeriac, red onion, parmesan, gruyére, tarragon, pinches of salt/pepper, tablespoon or two of heavy cream and mash until well mixed. Dust a clean surface with polenta and divide mixture into 3 or 4 balls. Shape into a patty about 1/4"-1/2" thick and coat with the polenta. Heat up a large skillet with 1TB of butter on medium heat, add the minced garlic. Let infuse and get fragrant for a minute. Gettin' fragrant with garlic, mmm. Add the spinach and stir until just wilted. Dump out into a bowl and melt the other TB of butter in the skillet. Add the celeriac cakes and cook for several minutes on each side, until a thin, brown, crispy coat forms. Remove cakes and set onto a plate, top with spinach. Replace skillet to medium/high heat (add a small splash of olive oil) and crack in eggs, cooking one at a time if need be. Cook for a minute on one side and then flip. Cook for another minute or so until the white is set, but yolk runny if desired. Place an egg on top of the spinach/cakes. Top with fresh black pepper and serve.